This build doesn't actually scale through ignite. Combustion's contribution is the fire damage multiplier and the fire penetration applied to enemies that are ignited. Edit - Though I see what you mean, I suppose there isn't much reason to not swap it out for Elemental Focus. It's not much of a damage gain but I'm not sure there's much downside either unless we wind up dropping Avatar of Fire later. Edit 2 - I went ahead and updated things to run Elemental Focus over Combustion until I think of a good reason not to. Maybe I was unclear, but what I tried to suggest was using HFT on another 6-link, and using some other skill on the soul mantle that also scales well with whatever we're doing with HFT. Two differnet totem skills, alternating. The HFT kills the curses from soul mantle. Anyway, I don't know if I want to play that way, but I'm imagining it could be good. Nevermind this, import pastebin works under „Import/Export Build” button at left-top corner. It looks like it counts the infusions to totems aswell, but totems can´t get infusions. 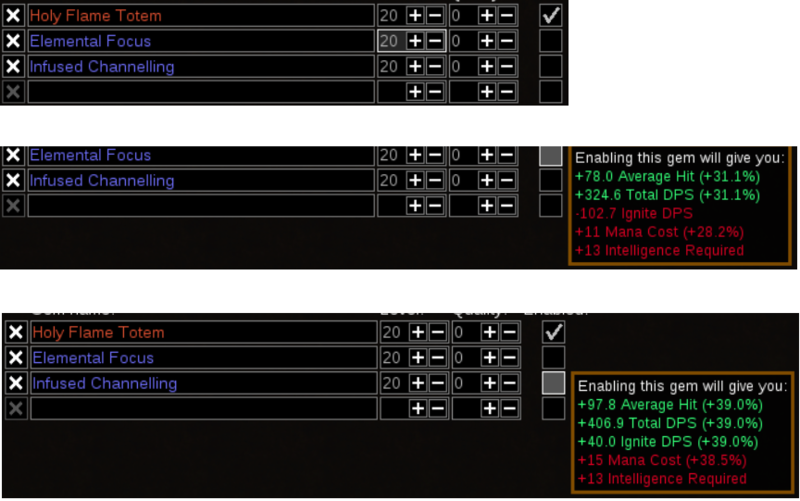 Not a bug, Infused Channeling grants 39% more damage to Channeled abilities at all times. Infusion only grants an additoinal 10% more damage to the damage type of the supported skill, which is what cannot be gained by totems. I'm guessing in your example Elemental Focus is only granting 31% because you did not fully convert Holy Flame Totem to fire damage in that PoB setup. playing on a 3-link Nycta's Lantern and +1 Totem Shield with Flamethrower Traps for Bossing, entering yellow maps ... soon i'll get the big guns out! I'm using Illuminated Devotion and Arcane Blessing in my version, and I mention this because it looks like PoB currently doesn't account for the arcane surge from this. If I add an arcane surge support artificially, the totem damage goes up as expected. edit: I checked the PoB website on this, and this bug was reported a year ago. Someone submitted a fix, and the issue was closed. So either the fix was ignored for some reason, or the bug has reappeared. I am appreciating the idea to use essence worm with herald of ash. I had an essence worm but had never used it. Too bad we don't get the +2 level aura bonus on that though. Seems like maybe the ring should give +2 to auras and heralds, or heralds should be considered auras.